Are you in shape for the pre-season? Pre-season training can be tough on the body, especially for corps members who have been away from the football field all winter long. 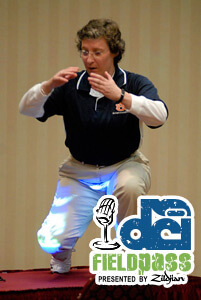 In today's Field Pass presented by Zildjian, an expert on marching fitness Dr. Wendi Weimar, director of the Sport Biomechanics Laboratory at Auburn University, offers her tips for getting in shape for the drum corps season.Subscribe to this podcast through iTunes. Field Pass archive.